Championship Sunday is here! The right to represent the conference in Super Bowl XLVII is on the line for 4 teams. Here are the KAT conference championship game predictions. The New England Patriots beat up on the Houston Texans for the second time this season to advance to the title game, while the Baltimore Ravens shocked the top seeded Denver Broncos. 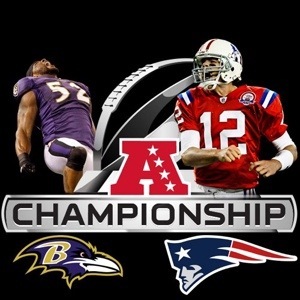 The AFC Championship game is a rematch of last season’s title game in which the Patriots won narrowly. Baltimore heads into Foxboro with a lot of confidence as they defeated the Patriots early in the season. Not only do the Ravens have one of the most physical defenses, they have a suddenly explosive offense. Joe Flacco has stepped up his game, and is looking to continue is stellar postseason. Look for Flacco to test the Patriots defense with the deep ball numerous times. On defense, the Ravens will look to pressure Tom Brady early and often. For the Patriots it begins and ends with Tom Brady. 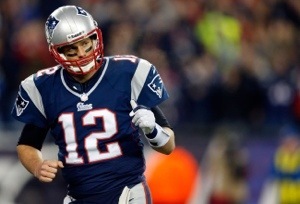 Brady who is looking to advance to his 6th Super Bowl in 12 seasons, also has a lot of stake in this game. Look for Brady to push the tempo utilize the no-huddle to keep the Ravens defense guessing. With Rob Gronkowski out, look for Brady to target Shane Vereen again in the passing game. Defensively the Patriots have to limit the success of Ray Rice on the ground and the secondary has to keep the speedy Ravens receivers in front of them. If Flacco has success with the deep ball, it could be a long night for the Patriots. When it’s all said and done, I believe Ray Lewis’ career ends in New England, and the Patriots will be heading back to the Super Bowl.